The eggplant has always been an odd sort of vegetable to me. It’s not crunchy, but not exactly soft either. The skin is a beautiful deep purple, while the inside flesh is an odd grayish-taupe color. When prepared the flavor varies wildly from a classic Italian parmesan dish to a creamy smoky baba ganoush dip. For all of its variety, though, I never could quite decide if eggplant fell into my “like it” or “not so fond of it” flavor preferences. 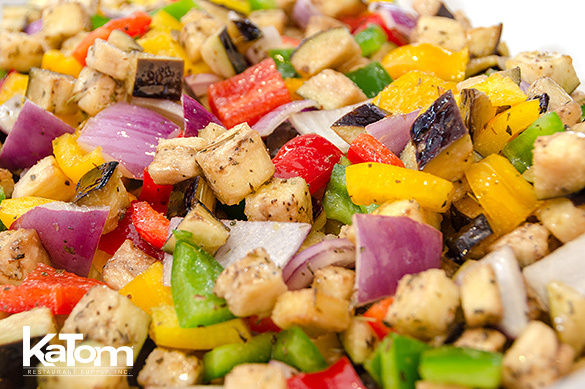 A few years ago, I discovered a version of this roasted eggplant salad and finally decided eggplant is now solidly in my regular rotation of tasty vegetable dishes. 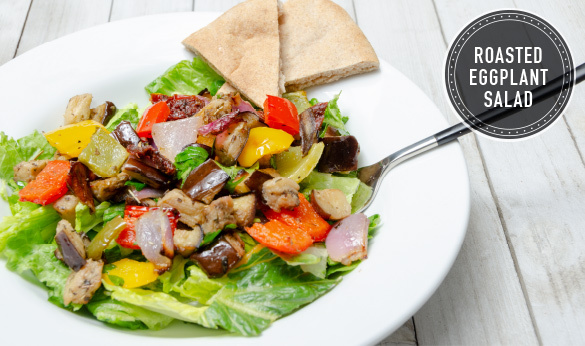 The restaurant where I first enjoyed this eggplant salad used a “house blend” dressing. I’ve played around with various versions and think I’ve managed to recreate a similar flavor profile; if you use a bottled dressing, look for a red wine and oil variety for a similar flavor. You can also adjust the amount of sun-dried tomatoes you add based on your preference and the variety you find. I really enjoy the strong punch of flavor a rich dried tomato adds to this dish and usually find myself layering in a bit extra. I’ve been a bit surprised to realize how impactful a good fresh bunch of parsley can be in a dish as well. Parsley has been a standard garnish for so long it’s really almost taken for granted and overlooked these days. However, I made this roasted eggplant salad without the parsley once and was surprised at just how noticeable the difference was. For such a seemingly “optional” ingredient, the parsley really does add just the right amount of fresh herb to this salad. 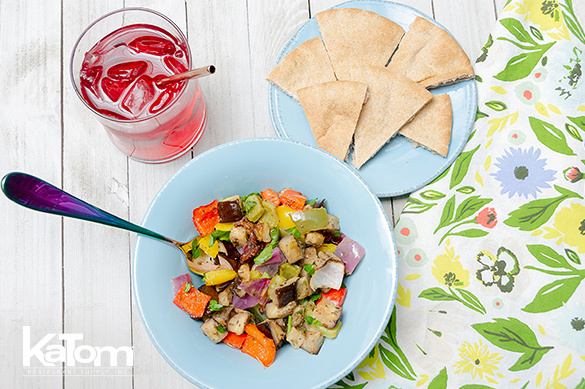 In addition to the terrific blend of flavors in this eggplant salad, I love how colorful it is and often make it for group gatherings and family meals. It holds up well in the fridge for days, so it’s a great choice to make ahead and take as part of my lunch later in the week. It’s quite filling on its own, but pairs well with grilled chicken or roasted pork loin for dinner. 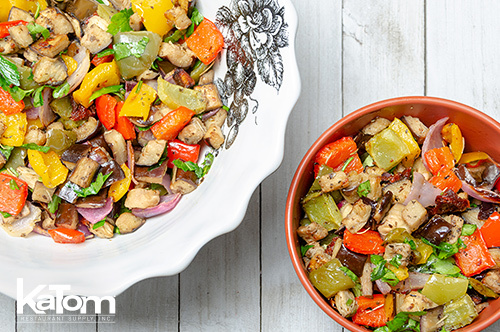 So let’s break away from the fried parmesan and enjoy this delicious, healthier roasted eggplant salad that’s certain to hit the repeat cycle in your kitchen. For the Dressing: Whisk all ingredients in a bowl or shake in a bottle to combine. Cut eggplant into 1-inch pieces. Salt and drain overnight using a rack over a pan. Rinse the eggplant and toss with half of the dressing. Cut peppers and onion into 1-inch pieces. Place in a large bowl and toss with remaining half of the dressing. Place all vegetables on parchment lined sheet pans. Roast at 375 F until tender, approximately 25 to 30 minutes. Cool vegetables. Then, combine with parsley and sun-dried tomatoes. Featured Products: American Metalcraft 6″ Straight Metal Straw, Copper; World Tableware 26-oz. Driftstone Bowl, Blue Hen 6.38″ Farmhouse Plate and 20-oz. Farmhouse Soup Bowl, Santa Cruz Dinner Fork with Chroma Handle, High Rise Salad Fork with Black Handle; Syracuse China 11-oz. Constellation Soup Bowl. Marie Powell grew up eating pecans, fresh fruits and vegetables, and homemade meals in rural southern Georgia. Thanks to her family's tradition of military service and the generosity and diversity of her friends, her culinary influences also come from Taiwan, Greece, and the Middle East. A graduate of the University of Georgia, she learned about food prep, storage, and presentation during her time as UGA's catering manager. Marie now lives in Phoenix with her daughter, Sophie, who has inspired her to learn more about adapting recipes for food allergies and intolerances, and their tortoise, Elizabeth, whose favorite food is dandelion greens.